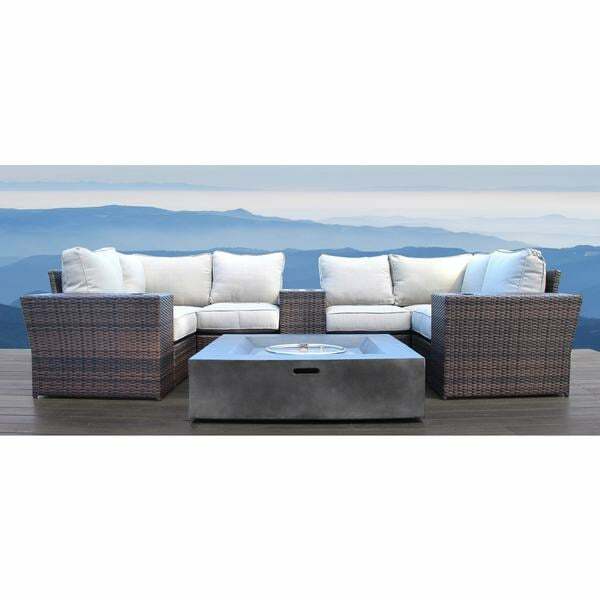 Enhance your outdoor living space with this beautiful, comfortable, and durable conversation set. This 10-piece set includes a fire pit with an automatic push-button ignition to keep your guests warm no matter what the season. "Any idea when this or any of the others like it by the same brand will be back in stock? I had it in my cart yesterday and now its gone. Thx"
"Are cushion covers removable/washable, and are replacement cushions available? Thank you." The cushion covers are removable and washable. "Does the fire pit take propane tank & where does it go, under the table? The pictures show rocks in the fire pit, is that included?" This fire pit is designed to go with a propane tank. The propane tank is external. Tank Covers are sold separately. The Rocks are included in the purchase. "How is it 10 pieces? The 8 piece of the same has the same configuration and pictures. "